The brief article below is a little piece I wrote for our local paper, the Huntington Beach Wave. It is scheduled to be published today on Reformation day proper. A Blessed Reformation Day to you all! October 31, 1517 - the hammer blow heard ‘round the world. On this date Martin Luther posted his famous 95 theses on the church door in Wittenberg, Germany. It was the 16th century version of Facebook and Twitter. If you had information you wanted people to read and discuss that’s where you posted it. But what drove Luther’s hammer that All Hallows Eve? It wasn’t fame and fortune. It was a simple question: How can a guilty sinner stand in the presence of a holy God? The church of Luther’s day had an answer: you can’t unless you made satisfaction for your sins. Luther worked hard, yet despaired. His good works were not enough to blot out his guilt. For Luther, finding forgiveness and salvation in the eyes of God was like climbing a never-ending ladder. And the church had an answer for this too. Buy an indulgence, a piece of paper which was sold to the people granting partial, and in some cases plenary (meaning full), remission of sins. Problem is, when Luther searched the Scriptures for answers he didn’t find God’s forgiveness up for sale. That hammer blow of October 31, 1517 goes to the very heart of what the Reformation is all about. It answered Luther’s question: How can guilty sinners stand before a holy God? On the basis of works, merits, pieces of paper, coins, or anything we do? No. Never. Rather, salvation is a free gift by the grace of God through Christ’s death. On the cross, Jesus took your sin and gives you his righteousness. He took your death and gives you his life. It’s a blessed exchange. That knock-knock of the hammer was the joyful proclamation of the Gospel breaking Luther’s despair. 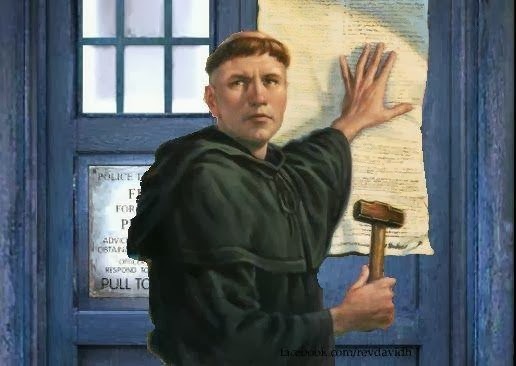 After Luther put the hammer away he picked up the pen and the Scriptures. He found in the pages of Scripture a Savior who rescues guilty sinners by being numbered with them. He found a merciful God who exchanged everything we have - sin, death, and guilt – for everything he has - holiness, eternal life, and righteousness. That was Luther’s comfort and it’s yours too. For there’s something else that comes to mind when I hear the knock-knock of a hammer. Nails. Wood. Hands. Feet. Christ Crucified for you. Jesus is your guarantee of eternal life. Jesus’ death for you. Jesus’ resurrection from the dead for you. So, do not fear. Christ bore your sin. Your guilt is covered. Your debt is paid in full. Death is destroyed. Rejoice in this good news. And that’s what the Reformation is all about. Dedicated to Rachel Bomberger and literary aficionados everywhere. Yesterday, my good friend and fellow bibliophile, Rachel Bomberger posted a review of Cornelius Plantinga's recent book (entitled Reading for Preaching) on her blog where she writes reviews for Eerdmans Publishing. Her initial review had more than a few choice quotes regarding the intersection of theology and literature, a corner I frequent regularly. Here are just a few of the highlights. It is a truth universally acknowledged (by English majors, at least) that good reading begets good writing. This is our Pythagorean Theorem, our Newton’s Third Law: if you want to become a good writer, read. Read broadly. Read deeply. Look for good literature wherever you can find it — in Shakespeare and Dickens, yes, but in the funny papers and the National Geographic, too. Soak it up eagerly. I couldn't agree more. After reading this quote again, I think there needs to be a simple addition: If you want to be a good preacher of the Word, read. Become a good storyteller. Now, I don't mean the kind of preacher that tells endless stories that have nothing to do with the Scripture readings used for preaching. In the end all that does is focus attention on ourselves, and that is the opposite of what being a good storytelling preacher should be. Good preachers tell the John the Baptizer story: Behold, the Lamb of God who takes away the sin of the world! So, this is that I mean. If good reading makes for good writing (and it does), then good reading also makes for good preaching. 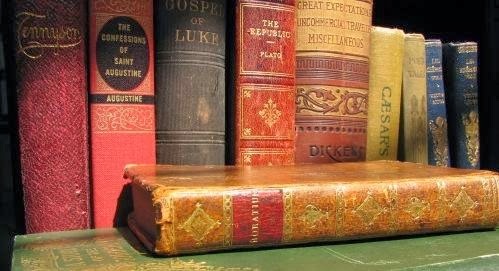 We must not be like Eustace, who never read the right books. And doesn't Jesus do this in the Gospels time and time again? He opened his mouth and spoke to them in parables. The kind of storyteller a faithful preacher needs to be is that kind, the one who tells the same story week after week and yet leaves the hearer wanting more. That's the kind of story that we find in the Gospels. For the Gospels are the best kind of story of all - a true story, or rather, a collection of stories, which need to retain both their historical veracity and their compelling narrative styles, their complex character development, their plot lines and story arcs. Because in the end, the Gospels are the one story preachers are called to tell every week. That's what we're doing in the creed, in the hymns, in the liturgy; here the Church continues to sit at Jesus' feet as he welcomes his baptized children to hear again and again the one story that really matters (and gives meaning to all other stories along the way). Christ was born. Christ has died. Christ is risen. Christ will come again. And here's one more quote that made my fingers itch to get to a keyboard. “Plantinga makes a striking claim: preachers who read widely will most likely become better preachers.” I’ve now read this page-turner of a book through twice, cover to cover, and Plantinga has me thoroughly convinced that his claim is a sound one. Not only, Plantinga argues, does reading widely give pastors a wealth of illustrative material to use in their sermons (Yay! Stories!) and teach them to craft more compelling sentences and paragraphs, it also — perhaps more importantly — helps them gain wisdom. After Rachel posted this, it got me thinking. What books would an English Major recommend a pastor read? So, I asked her on Facebook and she came up with a fantastic list, some of which I have read, others which are now on my reading list. Her blog post, What I'm Reading provides a delightful annotated list of 10 good book worth reading. Upon her suggestion I've also compiled a similar (albeit work-in-progress) type of list. With more or less commentary, here are a few good books every Christian, pastor or laymen, should consider reading. Crime and Punishment. Whether or not you've read any of the Russian novelists, Dostoevsky's work gives great insight into the nature of temptation, desire, death, and (yes) resurrection. From the description of sin echoing in the head Raskolnikov's (main character) head like a newborn chicken waiting to be hatched to the sublime Gospel in the use of Lazarus, this book is more than just an examination into the mind of a killer. It is a microcosm of daily dying and rising. Lord of the Flies. While we're talking about sin and it's consequences, I'd be remiss if I didn't mention this brief novel by William Golding. Some books illustrate the Gospel rather well. This one illustrates the Law and the twisted reality of human depravity in all its infamy. This is what life looks like East of Eden, beyond Genesis 3. It's a good reminder that when you take a cruise, we're all just one engine failure short of the same thing. Left to our own devices (like those boys on the island), we are savages according to Old Adam. Paradise Lost. I chose this one for the obvious reasons. But it's a good read nonetheless. And bonus if you can find a copy with C.S. Lewis' superb preface. That's almost better than the book itself. Fahrenheit 451. Although many skeptics have used this book against Christianity, it just as easily can be turned on those who would repress critical thinking, objective truth, and free speech / freedom of reading and writing. I first listened to this on audio book on a drive to Vegas and need to get a hard copy since there was more than one occasion where I wished I had a highlighter nearby. The Fall. If you want to understand different worldviews. And worldviews are marvelously portrayed in stories, such as The Fall. In fact, worldviews are stories. The question is which story (or worldview) best fits the facts. Reading this book will give you a good idea why Camus's philosophy is rarely adhered to in its entirety and, moreover, what a contrast the Christian worldview brings to life. Les Miserable. Now, I've read some great reviews that suggest that the movie is even more Lutheran than the original book, written by a Roman Catholic and replete with Roman Catholic teaching. That being said, there is still a rich treasure trove of Gospel patterns (a term coined by Francis Rossow in a book by the same title) in this book. It may be a long book but it's better than listening to Russel Crowe sing for two and half hours. Aesop's Fables. Luther recommended reading these. He even wrote prefaces to German editions of the Fables and used them repeatedly as illustrations in his writings and sermons. Their quick wit, wisdom, and pithy style lend themselves well for illustrating a particular point in a variety of contexts. Not to mention, stories with talking animals always have an appeal to me. The Tale of Desperaux. Kate DiCamillo's other book Because of Winn-Dixie is also worthwhile. Yes, it's a story about a mouse. But this also a story about an unlikely hero, a theologian of the cross type of hero. One who appears to be utterly weak and incapable, the most insignificant of creatures. And yet from this weakness comes great strength and heroism. Forgiveness, Rescue, and Redemption are also apparent themes throughout the book, making it more than just a good children's story (though there's nothing wrong with that). Biblo's Last Song. You can find this at the end of Tolkien's Lord of the Rings when Bilbo leaves the Grey Havens for the West. But you can also find it as a stand alone book, in verse form with vivid artwork from one of the best Tolkien illustrators around, Pauline Baynes. It's a pilgrimage song. It beckons the reader to a new world, one of peace, rest, and blessedness. Whenever I read this I think of John's words of consolation in Revelation with the Lamb, the city of New Jerusalem, and the faithful finally at rest, but restless in their praise. Tomorrow I may have another ten or more. But for today, that's a good start. Keep reading, my friends. Forget what you think you know about Bill O’Reilly. Forget about his right-leaning politics, his top-rated television show, and the millions of dollars he makes annually in books sales and entrepreneurial endeavors. And forget about his claim that God inspired him to write a book about Jesus. These are all rabbit trails, peripheral issues that will lead you away from the central issue regarding O’Reilly’s newest book, Killing Jesus. I must admit, I had mixed reactions when I heard Bill O’Reilly was publishing a new book in his “killing” series. On the one hand, his previous books such as Killing Lincoln were readable, engaging, and renewed peoples’ exploration into important American historical events, which are all worthy reasons to read and write a book. I was hopeful that Killing Jesus might do the same for people interested in exploring the historical evidence for Jesus’ physical death and resurrection. And after reading it I still think that is true on many levels. Over all, it’s interesting, fast-paced, and could be beneficial for the discerning reader. But on the other hand, I was and remain skeptical. How would a history teacher turned political pundit handle the historical analysis of Jesus of Nazareth? Having finished the book I find that my skepticism was not entirely put to rest, but rather was alarmed on several occasions. I continue to contemplate the following questions: Is this the kind of book I could hand to a skeptic asking questions about the historical trustworthiness of the Gospels? Would Christians find this book helpful in declaring and defending the Gospel? And did O’Reilly write the book he initially set out to write? All of these questions revolve around the central issue of O’Reilly’s Killing Jesus. So, what exactly is the epicenter of this book? Thankfully, O’Reilly tells us in his own words. This is not a religious book...Martin Dugard and I are both Roman Catholics who were educated in religious schools. But we are historical investigators and are interested primarily in telling the truth about important people, not converting anyone to a spiritual cause. That is the main issue with the book: historical content and verification of evidence. The primary question I hope to answer is this: Did O’Reilly, in fact, write a reliable historical account of Jesus of Nazareth? In order to answer that question, I’ve organized my thoughts in a few broad categories. When I first listened to the audio book of Killing Lincoln (I also examined its contents at a local book store), I noticed that the usual footnotes and citations which are commonplace in well-researched history books were noticeably lacking. Sadly, this writing style also pervades Killing Jesus. There are no footnotes at the bottom of the page or in a bibliography in the back of the book. In the opening pages the reader is greeted with the assertion that this is a well researched historical book. Outside of a list of books consulted, the authors provide no substantial means of verifying their research. Granted, there are various footnotes spread throughout the book. But these are mostly explanations about dates, religious customs, biblical citations, and the like. The only semblance of a bibliography comes at the end in the section titled Sources which does little more than name many of the books that were influential in their research. Among those works are some notable and respected names in Christian apologetics such as, Michael Licona, Gary Habermas, and Craig Evans. These men have all written outstanding books in defense of the Christian faith. Aside from this brief source section, there are no citations as to where and how these sources (or any others) were used throughout the book. Quite simply, there is no evidence, no citation, and no documentation. This is a remarkable failure for a book that claims to be historical. One of the fundamental principles in historiography is leaving a paper trail, and when you do research, documenting that paper trail for others to follow. It’s like my high school algebra teacher always told me, “Show your work.” O’Reilly and Dugard may have done lots of research. Exactly how much they did during the eight months it took to write is unknown. Therein lays the problem. There is no way for the reader (scholarly or leisurely) to check out the facts for themselves. Bill O'Reilly: I just want to write about important things in a very entertaining way. That's the formula. Norah O'Donnell: The title "Killing," using killing, a bit sensationalist? Bill O'Reilly: Of course. Of course it's sensationalist. That's who I am. I'm a sensationalist. I'm a big mouth. I get attention. In this world you have to--if you want a mass-market presentation, you have to get attention. Sensationalism sells. Unfortunately, sensationalism masquerades as scholarship. Most publishers and book stores have placed this book in the history section. And I’ve debated as to what category it should be placed in. It’s not fiction but, then again, it’s not entirely historical either, at least not in its current format. Perhaps the best category would be that of historical paraphrase. Now, there are many things O’Reilly’s book does well. For example it includes maps, helpful historical sidebars in the bottom margins, and the broad historical context of the Roman Empire leading up to and during Jesus’ life and ministry. But there are also glaring deficiencies. I’ve already mentioned the lack of historical documentation. However, beyond the specific issue of citation there is a broader concept lacking in O’Reilly’s book, namely, an overall explanation of his historical methodology. To his credit, he mentions a number of sources in the back of the book. And in his introduction he gives the reader a brief glimpse into some of the works consulted. …researching Killing Jesus required a plunge into classical works such as the four Gospels and the Jewish historian Josephus…the historical record may not have been as immediately accessible as that of more recent times, but men who wrote the history of that period were very much concerned with getting their facts straight and telling the story as completely as possible. Yet, something is missing. There is no clear explanation of how he arrives at the historical conclusions he makes. That is what I mean when I use the phrase, historical methodology. For example, if I were to assert that the Allied forces crossed the English Channel on June 6, 1944 how would someone determine whether or not this event actually occurred in history? Historical methods are important in establishing the probability that any given event took place, and that the retelling of the event is likewise a reliable report that later readers should trust. This is similar to the process used in court rooms when examining the evidence for a crime and rendering a verdict. As a side bar, in apologetics I have often argued that whatever historical methods we use and apply to other events in history, such as D-Day or the assassination of Julius Caesar, should likewise be used and applied to the death and resurrection of Jesus. Sadly, O’Reilly does not give the reader any criteria by which he judges sources to be historically reliable or unreliable. Furthermore, he claims that, “We had to separate fact from myth based on a variety of sources, some of which had their own agendas.” But he never cites any of those varieties of sources, nor the alleged myths and facts contained therein. One of the great strengths of the book, at least in my estimation, was the first third of the book where he addressed the socio-political climate of the Roman Empire and Judean leadership surrounding the lifetime of Jesus. However, he does not apply that same tenacity to the primary source documents of Jesus’ life, namely, the Gospels of Matthew, Mark, Luke, and John. The irony here is that the historical evidence for the reliability of Jesus’ life and ministry as recorded in these four Gospels outweighs all other historical documents from the ancient world. There are better manuscript and transmission records for the New Testament than for the entire corpus of ancient writings, including sources that historians readily accept as trustworthy witnesses, such as Seutonius, Tacitus, and Pliny the Younger. One of the greatest examples of historical methodology is found in the work of apologist John Warwick Montgomery. In his apologetic tome, History, Law, and Christianity Montgomery utilizes secular historical methods and applies them to the four Gospels. In this methodology there are three basic tests used to determine the historicity of the text in question and the events they record. The three tests are briefly described as follows. There is 1)the bibliographical test, which demonstrates how reliable the transmission of the documents has been over time; 2) the internal evidence test, which explores what the texts say concerning themselves and whether or not they have internal consistency and reliability; and 3) the external evidence test, which examines reliable secondary sources that either support or contradict the text in question. The genius of this method is that its origin is in the field of military history. So, there can be no skeptics’ cry of bias or padding the stats. The challenge, however, is that Montgomery’s books, such as his Tractatus Logico Theologicus, are rather weighty in their content. For one who might be new to reading Christian apologetics, a good place to begin would be with Montgomery’s History, Law, and Christianity, or with a sort of dumbed-down version of Montgomery’s Tractatus by the trial lawyer, Craig Parton, entitled, Religion on Trial. Now, back to O’Reilly’s Killing Jesus. Had O’Reilly lived up to his own famously ruthless standards of evidence and critical thinking in his book that he demands of his guests on his television show, the book would’ve been far better for it in the end. Now, this makes for an interesting parallel in Jesus’ life if it is true. But, where’s the evidence? No citation is provided and his claim is not substantiated. Later in the book, when discussing the ministry of John the Baptizer, O’Reilly also claims that the Jewish tax collectors were diverting money to Rome and that John himself may have been guilty of tax evasion, at least in the eyes of the Jewish religious authorities. It’s no secret that the tax collectors were ill-received guests at any party. Their greed and corruption is also well known and documented. And yet, O’Reilly cites no evidence in support of his claim that these tax collectors – thieves though they were – were also guilty of funneling money to Rome. The over-emphasis on taxes and economics in this book is overtly anachronistic. Again, the reader is left wondering, where’s the evidence? These are not original claims. Skeptics have been accusing the four Gospels of alleged contradictions for centuries. Writers have also made the argument that the Gospels are written from a religious or theological point of view and not an historical one. Again, where’s the evidence? O’Reilly doesn’t cite or seek to explain any of the alleged contradictions in the four Gospels. He simply echoes a familiar assertion. Many authors (such as O’Reilly) have avoided calling the Gospels historical accounts because they contain miraculous reports and events. However, this is disingenuous to the text. If a miracle occurred it is an historical event, no matter how unpopular or contradictory that may be to one’s worldview. Simply calling the Gospels “religious writings,” and separating them from history is problematic. If we remove Christianity from historical assertions, events, and investigation, we have removed it from reality. Faith is founded on fact, not fantasy. To say that a book about Jesus of Nazareth is purely historical and not religious is erroneous and betrays the historical foundations of the Christian faith. Simply put, in Christianity you can’t separate the two. Moreover, there is no justification for placing the Gospels in this unknowable and arbitrary category. The question that Christian apologetics seeks to answer is this: is there reliable historical evidence that a miracle (e.g. the physical resurrection of Jesus) actually occurred? Thankfully, a great deal of work has already been done in this area. C.S Lewis handily dealt with David Hume and the skeptics’ argument that miracles are not historical and that we can dismiss them simply on principle (a priori) because there is uniform experience against them. Writing history the way O’Reilly has done in Killing Jesus has the negative effect of causing readers to overlook important and credible criteria in investigating the information available that testifies to the fact that the miracles recorded in the Gospels are reliable history and the eyewitness accounts in them are likewise trustworthy. In other words, O’Reilly is echoing the unsupported assumptions of Hume, which taints his entire investigation of the Gospels’ claims. This fundamental problem is seen at the beginning of Killing Jesus, where O’Reilly claims that the Gospel writers were not engaged in writing history, but rather a spiritual account. Anyone who has read the New Testament, however, should recognize that this directly contradicts the words of the Gospel writers themselves. Consider Luke’s opening lines in particular. 1) The Gospel writers and the disciples clearly claimed that they were writing history. 3) Jesus of Nazareth didn’t enter into spiritual history or a mythological religious world, but as a real man in real time and real history in order to do real things. Jesus was born in the days of Caesar Augustus. And he was crucified under Pontius Pilate. Remove Christianity from history and you have to go all the way and say Jesus never existed. But no credible historians say that these days. Because no matter what one believes personally, the fact remains that these things did not happen in never never land. Who Jesus was and what he did can and should be investigated historically. Simply put, the Christian faith is founded on facts. So while claiming to write a history of Jesus, O’Reilly sabotages his own project right from the beginning, cutting off the historical branch upon which he claims to sit with an arbitrary saw that separates history and theology into watertight compartments. Had O’Reilly spent additional time establishing the case that the four Gospels are reliable primary source documents for the life and ministry of Jesus, Killing Jesus could be labeled history rather than a historical paraphrase. One of the other glaring problems I encountered with this book actually came from O’Reilly’s interview on 60 Minutes. 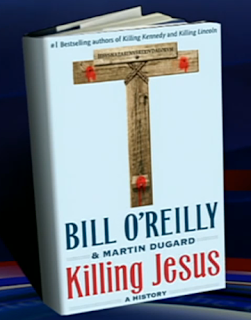 When asked why Jesus was killed – which is the entire premise of Killing Jesus – O’Reilly responded with perhaps the most outlandish claim of the book. Read the exchange carefully. Bill O'Reilly: Well, when he went into the temple and overturned those moneychangers he was absolutely livid. He was personally insulted that the temple was being used as a place of commerce. And not only that, but they were stealing from the folks. Norah O'Donnell: He was upset with people of his own faith. Bill O'Reilly: Absolutely. He was, he was upset that the Jews were taxing, overtaxing, and extorting the folks. Norah O'Donnell: And that story is important to tell because it explains why so many people wanted him dead? Once again the anachronism of our modern political landscape – taxes, class warfare, and all – entered into the analysis of the motivation for Jesus’ death on the cross. More to the point, however, is O’Reilly’s blatant misunderstanding of why the Jewish religious authorities wanted Jesus dead. Killing Jesus wasn’t about financial grievances (though they may have had those), economic hardships, or over taxation of the middle and lower class Israelites. If these were, in fact, the religious authorities’ motivation there is no evidence for it in the primary source documents. Killing Jesus was primarily about his claim to be God Almighty in human flesh who had come to die for the sins of the world on the cross and rise again. In the minds of the religious authorities, both his utter disregard for their man-made attempts to save themselves (and others) and his clear proclamations of blasphemy (e.g. claiming to be God in himself) were the reasons Jesus had to be put to death. Again, O’Reilly makes a remarkable assertion about the true nature of the central event in the New Testament without substantiating a single claim. As I mentioned in the introduction, I had mixed reactions both prior to and after reading O’Reilly’s latest book, Killing Jesus. Even after writing this review, I am still conflicted. I had hoped this would be a book I could use with skeptics, a good work of history by a popular level writer. However, I think any skeptic would ask the same questions I have posed of this book and its content. Where’s the evidence? How does O’Reilly corroborate his claims, especially when some of them directly contradict the primary source documents? Does O’Reilly really think he’s a better historian (2000 years later) than multiple eyewitnesses to the same events 2000 years ago? The real crux of the problem revealed in this book (and in subsequent interviews) is that O’Reilly fails to grasp both the central event of the Gospels – the death and resurrection of Jesus – and the methodology used by scholars and historians to establish the veracity of historical events as well as the reliability of the four Gospels as primary source documents. The one thing that O’Reilly does well, and that I appreciate about this book, was the narrative, storytelling-style he and his co-author wrote it in. I simply wish he would've combined the compelling forms of historical narrative that he does so well with the compelling substance of historical facts. Simply because an author tells a story doesn't mean it is unhistorical. In fact, the most exciting stories are those that are based on the facts and yet sound too good to be true. The Gospels are that kind of story. Jesus’ death and resurrection is that kind of story, one that sounds too good to be true and yet takes place in real human history. In the end, I won’t be handing this book to a skeptic who might be asking tough historical questions about the Christian faith because O’Reilly doesn't take the time to build a positive case for the trustworthiness of the Gospels and the physical death and resurrection of Jesus. And I’m not blaming O’Reilly for that. That simply wasn't the kind of book he set out to write. I do, however, think that is exactly the kind of book that is needed. Bill O’Reilly and Martin Dugard. Killing Jesus: A History. New York: Henry Holy and Company, 2013. P. 2-3. Bill O’Reilly and Martin Dugard. Killing Jesus: A History. New York: Henry Holy and Company, 2013. p. 275-276. For example, the earliest copy of Seutonius’s Life of Caesar dates to 950 A.D. and the earliest copy of Pliny the Younger’s Letters date to 850 A.D. In both accounts there is over an 800 year time span between the earliest known copy of the manuscript and the date it was written. Both are considered by classical scholars to be reliable documents and a valuable part of our knowledge of ancient history. When comparing these Roman historical manuscripts to those of the four Gospels, the difference is monumental. The time span between the dates when the Gospels were written (60-90 A.D.) verses our earliest known manuscript copy is between 140-265 years. Moreover, the sheer volume of manuscript evidence available for the four Gospels far outweighs that of anything else in antiquity (in excess of 15,000 copies to be precise). Craig Parton. Religion on Trial. Eugene: Wipf and Stock. 2008, p. 47-48. Bill O’Reilly and Martin Dugard. Killing Jesus: A History. New York: Henry Holy and Company, 2013. p. 66. Richard Bauckham, Jesus and the Eyewitnesses: The Gospels as Eyewitness Testimony. Grand Rapids: Eerdmans Publishing Company, 2006. p. 472-473. 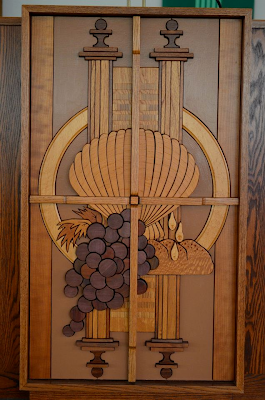 Sermon for Pentecost 20: "It's All about Forgiveness"
Today’s Gospel reading reminds me of my Grandma Schuldheisz’ soup recipes: a few fresh vegetables here, miscellaneous spices there - and don’t forget the leftovers from the freezer. “How’s all that going fit together?” I remember asking. But it always did and it was always delicious. Now, chances are you’re asking the same question today about Luke 17. What’s Jesus saying and how does it all fit together? First Jesus teaches about sin and how deadly serious it is. Then he teaches about rebuking and forgiving sin, especially forgiving sin. And then the disciples say, “Lord add to our faith” or “increase our faith,” depending on your translation. To which Jesus says some rather bizarre things about mulberry bushes and mustard seeds. Finally, he concludes the whole thing by telling the apostles a mini parable on service in the Kingdom of God and how those called by Christ to speak his Word are simply unworthy servants, doing what he has asked us to do. It seems like St. Luke took a bunch of miscellaneous ingredients that he didn’t know what else to do with and threw it together. Well, I submit to you that the main ingredient or way of understanding it all is this: It’s all about forgiveness. Jesus says, “Temptations to sin are sure to come”; they’re inevitable. “Sin happens.” And it’s deadly. It would be better if a huge millstone were hung around our necks and we were thrown Godfather-style into the ocean than if we were to cause someone to sin. Our sin needs rebuking. It's deadly serious. But more importantly, our sin needs forgiving. Did you catch that? You will forgive him. Like St. Paul’s words in Romans 5: “Now the Law came to increase the trespass, but where sin increased, grace abounded all the more.” What’s greater – your sin or Jesus’ atoning death on the cross that covers your sin? It’s Jesus’ blood, cross, and death – every time. It’s no accident Jesus uses the Biblical number 7 – the same day that creation was completed and called perfect and whole. Or like the disciples ask Jesus, how many times shall I forgiven my brother, “seventy times seven.” Forgiveness without limit. Forgiveness that makes you whole and restores you in Jesus’ death and resurrection. This is why Redeemer Lutheran is here in HB. This is why we have a preschool, Bible studies, and weekly confession and absolution – public and private. This is why Baptism is a daily gift. This is why we want to celebrate the Sacrament of the Altar more and more. Because more hearing and more receiving of Jesus’ Word and body and blood means more receiving forgiveness. These two things – repentance and forgiveness – these are what the church is given to do –all day, every day, every week, every service, in every age at in all places for all people. Rebuke and forgive. Rebuke and forgive. It’s like your shampoo bottles: rinse and repeat. If that’s what the disciple are saying, then Jesus is telling them you don’t need a combo-meal, Costco sized faith. Your faith – though hidden and small like a mustard seed - is enough to forgive. That could be what the disciples are asking Jesus to do. But when the disciples ask Jesus to increase their faith they may have in mind the second part of Jesus’ response: the miraculous, amazing things that faith does. And if the disciples are asking about what faith does, Jesus responds. If the disciples are asking for more faith because they don’t have enough to do the things Jesus says they should be doing, Jesus’ words are a rebuke. The great things faith does, Jesus says, come from him, from his power and his word, not their faith. The great works that faith does for others is not ours but Christ’s. Faith is God’s work not ours. We don’t run around with a faith-o-meter in our chests that must be turned from lukewarm to hot, high voltage sanctification over the course of our life. We’re not saved by our faith reading or spiritual levels, or even our morality index. All of those – as Jesus warns the disciples – are stumbling blocks to sin and salvation by works. Rather, the Christian faith works this way: faith is not self-admiration. It is the opposite, the total death of ourselves. Our Christian faith isn’t an endless refinement of our spiritual gas, but trusting this message: “the righteous shall live by faith.” That righteousness given you by the grace of Jesus who abolished death and brought light and immortality to light through the Gospel. “Well, which is it?” we ask. What is Jesus telling us – even a little faith is enough or we don’t have enough faith? I happen to think it’s both. You see, to be a disciple of Jesus isn’t to ask for the faith to work the kinds of miracles Jesus did or to look at your faith and say, “Wow, that’s impressive. What a good Christian I am.” It is rather to have faith in the miracles worked by Christ. So, the disciples and we do not need more faith in order to do wondrous things. Christ’s gift of faith given to you by water, word, and Spirit is enough. Jesus gives us faith and trust in Him both to receive and to give out his greatest miracle, which is the forgiveness of sin. Jesus takes the mulberry tree of our sin, a tree whose roots are firmly planted in each one of us, and he plunges it into the heart of the sea. In his death Jesus cast himself into the depths of our iniquity to rescue us. Jesus drowned himself in our sin and death in order to pour out the forgiveness of sins upon you in Baptism. 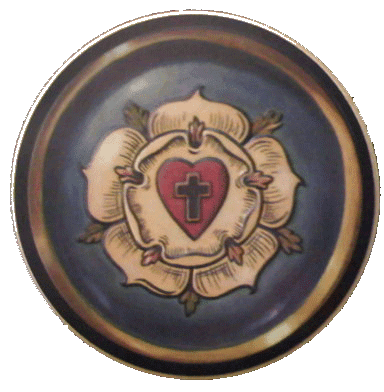 All of your sin – your boasting in your own faith and your lack of faith – it sinks to the bottom of the font quicker than a millstone. 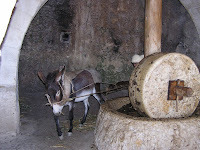 Jesus took that millstone that was around your neck and threw it around his own for you. 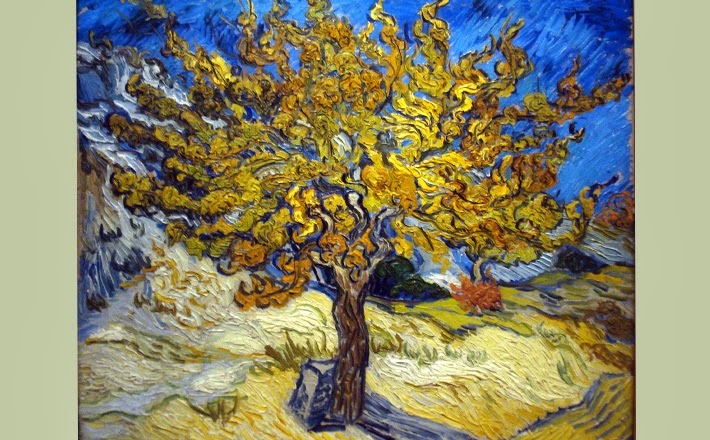 Christ uproots your sin and plants you in the cross, your tree of life. So it is for you in your vocations. You’re called to show mercy and share the Gospel. And when you do so, you have simply done what is your duty. For the Christian economy works this way: we live by faith in the Lord who saves and gives without thought of recompense and we live in faithful service to the neighbor without thought of reward. 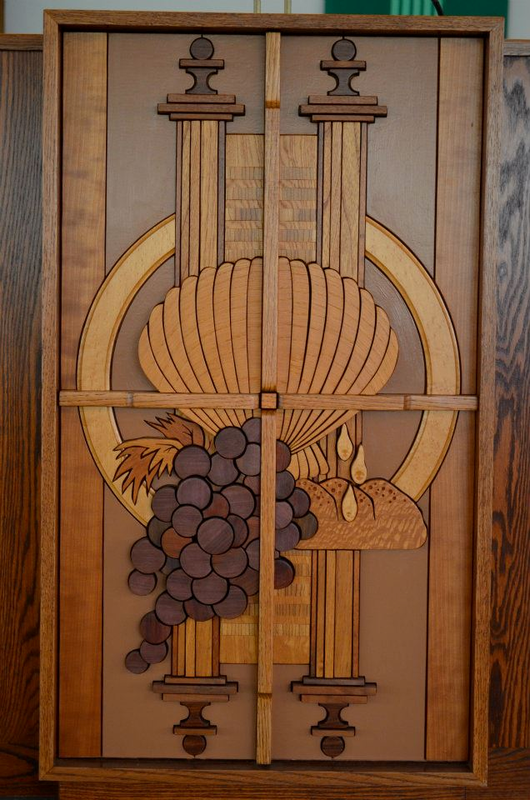 Nowhere is there a better picture of Christ’s undeserved love for unworthy servants than here at the Lord’s Table. Here, the Master becomes the Servant. The Giver of daily bread is your daily bread. The Lord of life gives his own life to you. At this table, Jesus prepares the supper for you. Jesus dresses you in the proper Baptismal garments and serves you His enfleshed forgiveness. Jesus fulfills his very own words. Come at once and sit at my Table. Take, eat; this is My body. Take, drink; this is My blood, shed for you for the forgiveness of sins. Here, unworthy servants are forgiven. And that’s the greatest miracle of all. Forgiveness isn’t just one of many reasons why this church and school is here; it’s the only reason. Everything we say and do around here is so that Jesus’ forgiveness is proclaimed, heard, received, and trusted – for us and for all. This reading, this church, this Christian life – it’s all about forgiveness for you in Christ Crucified.